During the term we train Mondays and Thursday from 8 – 10 at Hugh Cubitt Centre 48 Collier Street, N1 9QZ and Friday evenings from 7.30 – 9.45 in the dojo, Bloomsbury Fitness Centre, 15 Gordon Street, WC1H 0AY. Jiu Jitsu is Japanese for gentle or yielding art. There are a number of kinds of jiu jitsu, all with origins in the unarmed combat techniques of the samurai. We don’t do Brazilian Jiu Jitsu — we enjoy ground fighting, but it’s not our focus. Our club is part of The Jitsu Foundation, the largest single style jiu jitsu organization in Great Britain, with around 3,000 active members, 100 clubs in the UK and affiliates all over the world. We trace our roots back, via Australia and Shihan Matthew Komp (10th dan in jiu jutsu), to Japan — it’s likely that his instructors had a connection to the Kodokan. There’s a bit more about our history on the Jitsu Foundation’s website. Is the club actually good? We’ve won an unprecedented 17 national competitions outright, in both jiu jitsu and judo. The national shield, given to the overall winners of the competitions each year, was retired with us in 2013 because we’ve won it so many times. The club has been UCLU Sports Club of the Year and Jitsu Foundation Club of the year several times, and our instructors have been voted Instructor of the Year too. We are a large club with a good mix of men and women, a good spread of different grades, and we’ve produced nearly 30 instructors over the years. We regularly have the most students passing gradings in the largest region in the Jitsu Foundation. These are all good signs of a good club. We’re not bad. What techniques do you learn? We are primarily a close quarters, grappling martial art, with an emphasis on self-defence situations. We do some vital point striking, punching and kicking, defensive movement, a lot of joint locking, falling, and a lot more throwing. We learn defences from punches, kicks, headbutts, a variety of grabs, armed attackers, and multiple attackers, both armed and unarmed. We also work on the soft skills of violence avoidance and awareness. The club is taught by James Garvey Sensei, a senior second dan in our style, who has been with the club since 1994. Ian Sillitoe, also a senior second dan in our style, takes one session each week. Fridays are run by Emily Rowley, shodan, and Man-Yiu Wong, a brown belt. All are fully accredited by the Jitsu Foundation. It’s best to arrive 10 minutes before the session starts, to change and help put the mats down. We begin with a warm up (some cardio and strength training), and then some falling practice (learning how to roll around and fall safely). The instructor demonstrates a technique, and we pair up to practice together, then more demonstrations, more practice, and so on. Every session is different. Usually there is some pressure testing at the end, to see how well we can apply what we’ve learned. We then repair to the pub. The club is open to anyone over 18, student or not. I’ve never done a martial art before. Are there beginner’s courses? We welcome novices all year round — you can come along to any session. I have done Jiu Jitsu before; can I start where I left off? If you have graded in the Jitsu Foundation’s style of Jitsu, then of course you can wear your old belt and come along. If you have graded in another style of jiu jitsu, our practice is for you to start out as a white belt and train at whatever level in the club seems to match your own. You can then attend the next Foundation grading, and the grading panel will grade you where appropriate. As the sessions are practical, it is best to wear something loose and comfortable, like track suit bottoms and a t-shirt. You will need to remove all jewelry as well. If you want to buy a judogi (training clothes), the club takes orders and purchases directly from a wholesaler. If you have a gi from another style you are welcome to wear it, but anything less sturdy than a good judogi is likely to be torn. Because our instructors take no money, we charge just enough to buy kit, pay for hall hire, and subsidize club members’ courses. A regular session costs just £3 for students, £5 for non-students, and we offer termly discounts and joining packs that will save you a lot of money. Because the gym charges an entry fee, we don’t charge at all for our sessions in the Bloomsbury Fitness Centre on Fridays. We do not charge for your first session, so you can try jiu jitsu for free. 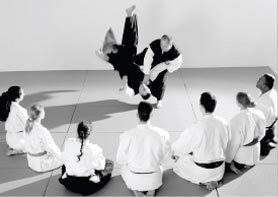 After your first session, you will need to join The Jitsu Foundation for insurance purposes, which costs £30 per year. Feel free to come along to any session and just have a look, but the best way to find out about Jitsu is to take part — here’s how to join in. You can also contact us if you have other questions.